Dave Hughes and Stuart McNay of the U.S. sailing team in action before their 470 class race on Day 9 of the Rio 2016 Olympic Games at the Marina da Gloria on Aug. 14, 2016, in Rio de Janeiro. RIO DE JANEIRO — The U.S. sailing team left the 2012 London Olympics without any medals — it was the first time Americans had failed to place in an event since the 1936 Berlin games. They weren’t even that close, either. Sixteen sailors, across 10 events, and the best anyone managed at the 2012 London Olympics was fifth place. They were disappointed with the result, one that brought the failure of U.S. sailing — one of those sports we only really hear about every four years — to the forefront. “It was really hard to watch, you could see it unfolding,” said Dean Brenner, the former chairman of U.S. Sailing’s Olympic Sailing Committee, about their performance in London. “And it was hard to deal with. It was was a very public stage, and we took our heat for it.” But Brenner was already on his way out after London, and the person taking over — Josh Adams — had four years to turn things around before sailing was back in the spotlight. The first thing he did was get down to Rio. Sailing is among the Olympic sports most influenced by environmental factors. “There’s quite a bit of randomness in our sport,” said Adams, the managing director of U.S. sailing. Despite the randomness, he said he knew that data acquisition would be paramount to the team’s success at the 2016 Olympics. “Rio de Janeiro was not a routine stop on the Olympic sailing circuit. There wasn’t an existing body of knowledge or data we could draw from, so as a team we had to start from scratch to learn about this venue,” he told me. The geography of Guanabara Bay, the site of all of the 2016 sailing events, makes it one of the most unique and difficult sailing venues in the world. The large bay funnels out through a very small opening to the Atlantic Ocean, resulting in strong currents and erratic winds that whip around the 1,299-foot-tall Sugarloaf Mountain. And a lot can change from inside the bay — which is characterized by flat waters and a more complicated current — to outside the bay on the open ocean, where waves can reach 15 feet high. So for the past three years, U.S. Sailing has been collecting data about Rio: about its currents, its winds, its tides, when the sun sets and where trash accumulates — any information that could potentially help the U.S. sailors better understand the complexities of Guanabara Bay and its seven race courses. While the exact location of courses on Guanabara weren’t finalized until the fall of 2015, test events in the two years prior gave Team USA a pretty good sense of where the races would be. Even with the extensive weather playbook, the U.S. team’s preparation for Rio went beyond just daily forecasts of winds and currents. They also worked closely with Deltares, a water and subsurface research company, whose current prediction software aimed to help Team USA’s athletes understand not just the conditions before the race but what to expect during the race. Even with all of this information available to them, a sailor’s ability to interpret changing conditions on the fly is part of what distinguishes great sailors from good sailors. They’re constantly weighing the historical data they have about a place and its conditions at that time against what they’re seeing and feeling during the race — no different from an NBA player digesting whatever stats the analytics team put into the scouting report and weighing that against what he sees on the court. Interpreting the data correctly is as important as having good data to begin with. For instance, in slower boats like the Finn or the laser radial, information about the current is more important than it is for the quicker boats. Two knots of current on a boat that’s going four knots has a huge impact on those boats, but on a boat like the Nacra 17 going 15 knots, two knots isn’t as crucial. “The playbook is not precise for every class,” said McKee. There are dozens of other variables beyond just weather conditions that sailors are trying to prepare the boat for — the position of its mast, the way the mast bends, how tight the shrouds are — but that often need to be adjusted during the race, too. You have to be able to understand the data, but you have to have good tactics, too, says McKee. “If you go the right way but you’re slow, you’re still going to be in trouble,” he said. Sailing isn’t just balancing data and intuition, it’s a game of risk, too. 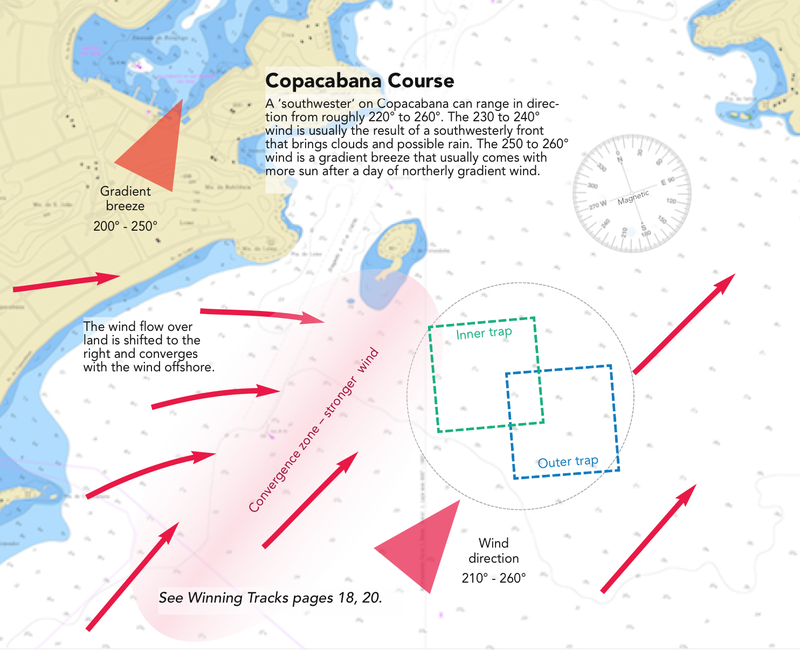 The entire regatta spans 10 days, across seven courses, and the winner is determined by the lowest total number of points after the last race (with double points awarded on the final medal race.) Sailors are constantly measuring risk and reward, deciding when it’s better to remain part of the fleet or gamble and break free. As of Monday morning, Paine sat in fourth place overall ahead of Tuesday’s medal race, just 5 points behind the contender currently in bronze medal position. Scutt and her partner, Paris Henken, are in sixth place overall and 10 points from third place. Others, like Paige Railey on the laser radial, enter the final race mathematically eliminated from medal contention. “There’s a lot in a sailor’s head when it’s time to race,” said McKee. “And a lot of it comes down to getting them in a mental state where they can apply what’s been learned, but also be free enough to actually sail in real time.” In other words, weighing three year’s worth of highly specific data against the data that you’re getting during the race — and being able to reconcile the two. Team USA has bet that good instincts combining with better data will carry it to medal contention before it’s off to Tokyo to begin the whole process again.